Barcelona: Union Health Minister Harsh Vardhan has favoured a complete ban on e-cigarettes and all products described as “Electronic Nicotine Delivery Systems (ENDS)”. 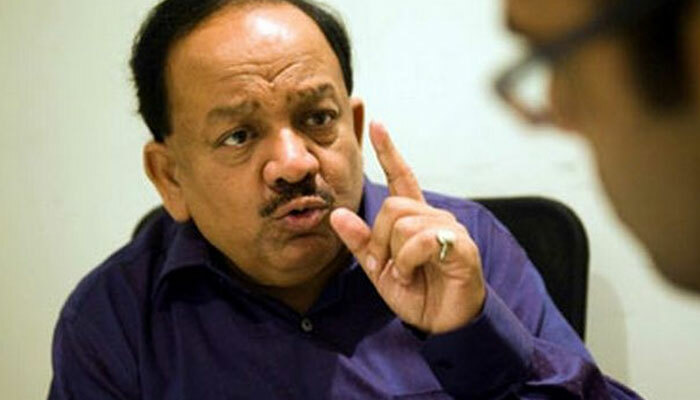 Harsh Vardhan ruled out their acceptability in the light of research findings by experts which have held that they are no less unsafe than the “real thing”, a statement said here Wednesday. An e-cigarette, personal vaporizer (PV) or electronic nicotine delivery system is a battery-powered vaporizer which has the feel of tobacco smoking. The minister, who was addressing global tobacco control experts at the 45th Union World Conference on Lung Health here Tuesday, said e-cigarettes and similar products push children towards the tobacco habit eventually via nicotine dependence. “In our national consultation, it has been shown that children and other non-smokers tend to develop nicotine addiction at a rate greater than situations where ENDS did not exist. And after that the slide to tobacco is practically inevitable,” he said. India is home to 275 million tobacco users. The use of smokeless tobacco has become a major public health menace, which, if not checked in time with strong measures could become a national threat. The aggressive marketing strategies marked by attractive packaging, flavouring and price cuts represent a major challenge for the government. “I am sure all experts present here are aware of the power of the tobacco industry. India is committed to taking proactive measures to counter the challenges they throw up,” he said. In this context, he mentioned India’s recent climbing to the first position among countries notifying mandatory printing of warnings on the largest surface area of packages containing cigarettes and other forms of tobacco. The new rules demand pictorial health warnings on 85 percent on both sides of tobacco packs.